Kamala Harris Is Running for President in 2020. Here’s Where She Stands on 8 Important Issues. Democratic Senator Kamala Harris is the latest woman to enter the 2020 presidential race, announcing on Martin Luther King Jr. Day that she was joining the already-crowded Democratic primary pool. 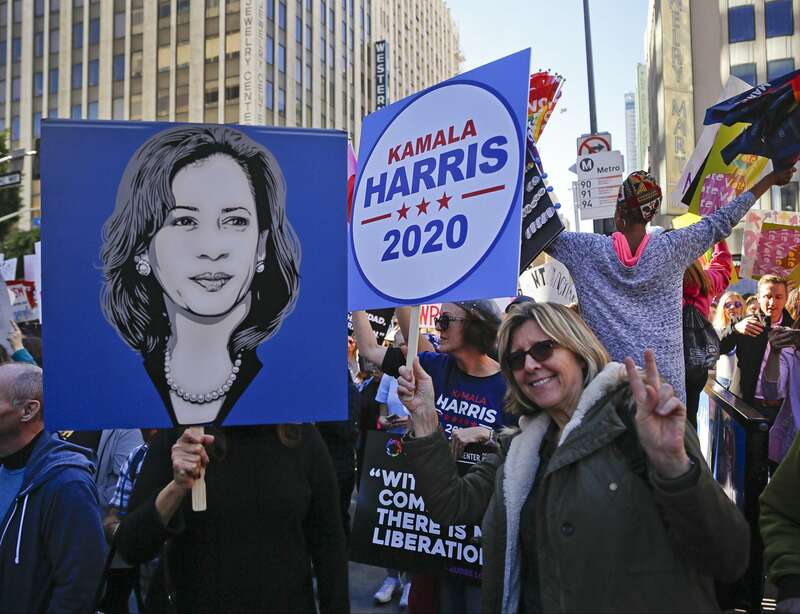 Harris, 54, was born in Oakland, to immigrant parents; her mother is originally from India, while her father is from Jamaica. After she graduated law school, Harris was a deputy district attorney before serving as the District Attorney of the City and County of San Francisco. She then became the first African-American and the first woman to become California’s Attorney General, a position she held until 2016, when she ran to represent California in the U.S. Senate. She’s California’s first African-American senator, the country’s first South Asian-American senator, and if she secures the Democratic nomination for 2020, she’d be the first African-American woman to be a major party’s nominee for president. Below, ELLE.com breaks down where Harris stands on the eight issues voters cared about most going into the midterm elections. Harris has been critical of the Trump economy, saying that while unemployment is low, there are still many American families struggling to stay afloat and that the economy “is not working for working people.” She’s also encouraged workforce training in order to prepare people for the future of automation. She’s also supported DREAMers and the Deferred Action for Childhood Arrivals program; in 2017, Harris said she would oppose any end-of-year government spending bills unless Congress acted to protect young people affected by DACA. Before she ever got to D.C., Harris had a long record of immigration work: While working in San Francisco, she started a job training program for ex-convicts that allowed undocumented immigrants to participate. (She has said before that illegal immigration is “a civil violation, not a crime.”) In California, she also helped create legislation that would protect immigrants who reported or testified about crimes from deportation. During a speech at the 2017 Women’s March, Harris implored the nation to prioritize women’s issues, which she says include things like the economy, national security, healthcare, education, criminal justice reform, and climate change. Harris supports a ban on assault weapons and on the sale of high-capacity magazines. While Attorney General, she also introduced a California-wide sweep to seize illegally-owned firearms; more than 1,200 firearms ended up being collected. While Harris supports the Second Amendment, she also says she supports common-sense safety laws and universal background checks. In 2018, Harris was one of the Democratic Senators who signed a letter to Trump saying he did not have the authority to order a preemptive strike against North Korea without permission from Congress. She has also criticized Trump’s strategy in the past, saying, “My concern is that we cannot conduct our foreign policy through tweets.” Harris has also been vocal about disagreeing with how Trump decided to withdraw troops from Syria, a move that contributed to the resignation of former Secretary of Defense James Mattis. Last year, Harris also gave an off-the-record speech at the American Israel Public Affairs Committee conference, where she spoke about her support for United States-Israel relations. Harris is for a $15/hour minimum wage, saying she believes the minimum wage should be a living wage, and she’s advocated for equal pay between men and women, as well as a federally mandated paid family and sick leave. Harris was one of a number of senators who entered the national conversation during the confirmation hearing for Supreme Court Justice Brett Kavanaugh, who has been accused of sexual assault and sexual harassment. During the confirmation, Harris aggressively questioned Kavanaugh, specifically asking him about special counsel Robert Mueller’s investigation and a woman’s right to an abortion. She ended up voting “no”on his confirmation.